— Early 2nd century: Christians by this time have developed church infrastructure to assist the sick. This assistance is usually led by deacons and deaconesses and focuses on palliative care. — Late 2nd century: Galen (c. 131–201) practices as a physician and publishes the medical treatises that will form the basis of Western medicine for centuries. — 250–51: Devastating plague spreads throughout the Western Roman Empire, causing the church to expand its program of benevolence. The church at Rome is said to minister to 1,500 widows and others in need, spending annually an estimated 500,000 to 1,000,000 sesterces. — 4th century: Bishops in the eastern half of the empire begin to establish xenodocheia as Christian welfare institutions for the sick and poor. — 330: Basil of Caesarea (c. 330–379) is born into a Christian family from Cappadocia in Asia Minor (central Turkey). — 360: Basil founds his hospital in Cappadocia; he is ordained bishop in 370. — Late 4th century: John Chrysostom (c. 349–407) tells us that the Great Church in Antioch, Syria, supported 3,000 widows and unmarried women, as well as the sick, the poor, and travelers. — Late 4th century: Fabiola (d. 399?) establishes first Roman hospitals. — 540: The Nestorians, having been forced to flee after the Council of Ephesus (431) declared them heretics, found a hospital at Gondishapur on the Persian Gulf which becomes a center of medical knowledge from a number of traditions: Persian, Alexandrian, Greek, Jewish, Hindu, and Chinese. — 526: Benedict of Nursia (c. 480–c. 530) founds his monastery at Monte Cassino. His Rule emphasizes hospitality to the stranger. — 541–749: Repeated waves of bubonic plague strike and devastate the Eastern empire. — 549–580: First hospitals founded in France and Spain. — 7th century: Isidore of Seville (c. 560–636) publishes Etymologiae, an encyclopedia of classical learning that includes a lengthy guide to Greek medicine. — 7th century: The Venerable Bede (c. 672–735) collects and publishes medical writings. — 9th century: Medical School at Salerno founded. — 937: First hospital built in England. — 9th–10th centuries: Benedictine monks in the West preserve ancient medical science during a time of unrest as they copy medical manuscripts, maintain herb gardens, and experiment with elixirs to cure diseases. Hospitals enter period of decline, lack of funds, and in some cases destruction, but many bishops and clergy still work to do what they can for the poor. 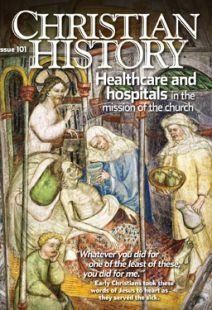 — 9th–10th centuries: Jerusalem Hospital founded by a community of Augustinians. — 1099: First Crusade arrives in Jerusalem and new building erected for the Jerusalem Hospital, funded by donations of grateful and wealthy crusaders. — By 11th century: a succession of Benedictine monks at the Medical School at Salerno, in cooperation with Jewish translators, have translated many Greek and Arabic medical texts into Latin, re-introducing them to the West. The most popular translated texts are known as the Articella (Little Art of Medicine) and include Hippocrates and Galen. — 12th century: Religious orders devoted to the care of the sick begin to arise, most of them following the Rule of St. Augustine (based on writings of St. Augustine of Hippo [354–430] although not traceable directly to him). housing around 1,000 patients in as many as 11 wards. Muslim and Jewish patients are welcome too, and are fed chicken in place of pork. — Early 12th century: Franciscan order of mendicant (“begging”) brothers arises from the life and work of Francis of Assisi (1182–1226). ranciscans and other similar orders (Dominicans, Carmelites) originally own no property, and emphasize works of mercy and identification with the poor. — 1113: Brothers of Hospital of St. John, later Knights Hospitaller, established as first international religious order. — 12th century: Full development of the doctrine of purgatory out of earlier ideas of the necessity of doing penance for sins. This provides further impetus for Christian almsgiving. — 1136: Construction begins on the Pantokrator, the greatest of Byzantine hospitals. — c. 1145–early 13th century: Augustinian brothers from Montpellier in France organize hospitals dedicated to the Holy Spirit, first in France and then (1204) in Rome. The order and the hospitals founded by them spread widely throughout Europe. — 1187: Saladin captures Jerusalem and forces Knights Hospitaller to leave. They found other hospitals in the Holy Land. — 1191: Teutonic Order founded in the Holy Land as a brotherhood devoted to the service of the sick; later moves its base of operations to Germany. — 12th–13th century: The rise of the mendicants and devotion to the Passion radically increases the number of hospitals founded in Western Europe. Hundreds of leprosaria are also built to deal with an epidemic of leprosy. — Early 13th century: Pope Innocent III (1160–1216, made pope 1198) promotes the new outpouring of piety among the mendicant orders. — 1207: Innocent III adds “burying the dead” to the six works of mercy noted in Matthew 25 (feeding the hungry, giving drink to the thirsty, giving shelter to strangers, clothing the naked, visiting the sick, visiting the imprisoned); these became known as the Seven Comfortable Works. — 13th century: Elizabeth of Hungary (1207–1231) becomes a symbol of Christian charity; widowed at 20, she gives her wealth to the poor and builds hospitals. — 13th century: Regimen Sanitatis Salernitatum is compiled, one of the most famous of medieval “regimens”; it supposedly originates at the Medical School at Salerno. — 13th century: Earliest known contracts for public physicians (employed by towns and cities) in Italy. This system spreads throughout Europe by the early 16th century. ­— 13th–16th centuries: Over 150 hospitals founded in Germany. begin to develop in Europe. — 16th century: Order of St. John of God begins building hospitals for the insane in Spain.